For present (formerly Highland Rly.) Elgin Station (NJ 2183 6219), see NJ26SW 102. (Location cited as NJ 221 622). Elgin Station, rebuilt 1902 by the Great North of Scotland Rly. An elaborate through and terminal station with the main offices on the down side in a two-storey and attic ashlar block, basically on an H plan, with wings at both ends. Now closed to passengers, though the goods yard, with wooden shed, is still in use. 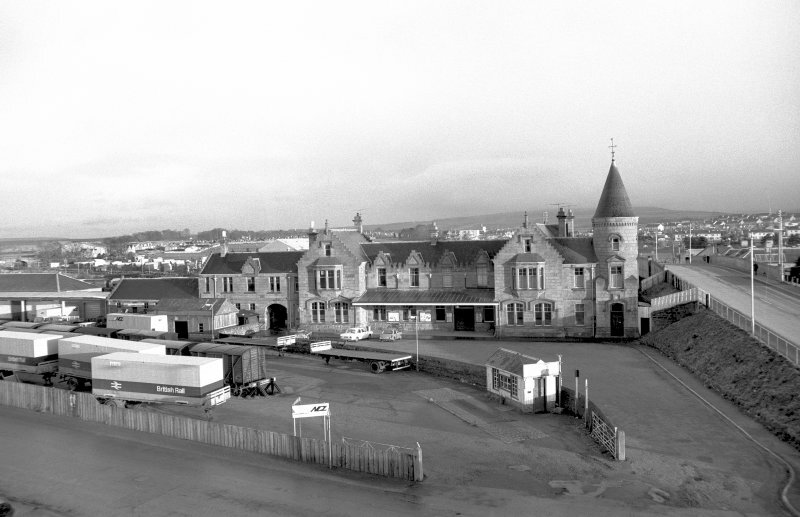 This station was opened as the terminal station of the Morayshire Rly. (serving branches along the Moray coast) on 10 August 1852. It was incorporated into the Great North of Scotland Rly. and closed to regular passenger traffic at an unspecified date.